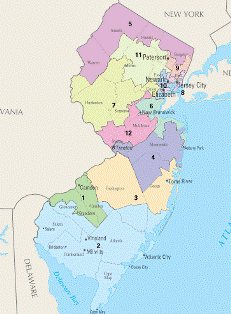 New Jersey will hold Special Primary and General elections to fill the 1st Congressional District House seat vacated by Congressman Robert Andrews. The Special Primary will be held on June 3, 2014, and the Special General will be held on November 4, 2014. Candidate committees involved in these elections must follow the reporting schedule posted at https://transition.fec.gov/pages/report_notices/2014/nj01.shtml. That schedule also applies to PACs and party committees that participate in the elections and file on a quarterly basis in 2014. PACs and party committees that file monthly should continue to file according to their regular filing schedule. Reports filed electronically must be received and validated by the Commission by 11:59 p.m. Eastern Time on the applicable filing deadline. Electronic filers who instead file on paper or submit an electronic report that does not pass the Commission’s validation program by the filing deadline will be considered nonfilers and may be subject to enforcement actions, including administrative fines. Registered and certified mail. Pre-election reports sent by registered or certified mail must be postmarked on or before the mailing deadline to be considered timely filed; other reports must be postmarked by the filing deadline. A committee sending its reports by certified mail should keep its certified mailing receipt with the U.S. Postal Service (USPS) postmark as proof of filing because the USPS does not keep complete records of items sent by certified mail. A committee sending its report by registered mail should keep its proof of mailing. Note that a certificate of mailing from the USPS is not sufficient to prove that a report is timely filed using registered, certified or overnight mail. 2 U.S.C. § 434(a)(5) and 11 CFR 100.19 and 104.5(e) and (i). Overnight mail. Reports filed via overnight mail [FN1] will be considered timely filed if the report is received by the delivery service on or before the mailing deadline. A committee sending its reports by Express or Priority Mail, or by an overnight delivery service, should keep its proof of mailing or other means of transmittal of its reports. 2 U.S.C. §434(a)(5) and 11 CFR 100.19 and 104.5(e). Other means of filing. Reports sent by other means—including first class mail and courier—must be received by the FEC before the Commission’s close of business on the last business day before the filing deadline. 11 CFR 100.19 and 104.5(e). Forms are available for downloading and printing at the FEC’s website and from FEC Faxline, the agency’s automated fax system (202/501-3413). A participating candidate’s principal campaign committee must file a 48-hour notice each time it receives a contribution of $1,000 or more between May 15 and May 31 for the Special Primary and between October 16 and November 1, for the Special General. Political committees and other persons must file 24-hour reports of independent expenditures that aggregate $1,000 or more between May 15 and June 1 for the Special Primary and between October 16 and November 2 for the Special General. This requirement is in addition to that of filing 48-hour reports of independent expenditures that aggregate $10,000 or more during the calendar year up to and including the 20th day before an election. The 48-hour reporting requirement applies to independent expenditures that aggregate at or above $10,000 prior to May 15 for the Special Primary. For the Special General, the 48-hour reporting requirement applies to independent expenditures that aggregate at or above $10,000 prior to October 16. The 30-day electioneering communications period in connection with the Special Primary runs from May 4 through June 3. The 60-day electioneering communications period in connection with the Special General runs from September 5 through November 4. Campaign committees, party committees and leadership PACs that are otherwise required to file reports in connection with the special elections must simultaneously file FEC Form 3L if they receive two or more bundled contributions from any lobbyist/registrant or lobbyist/registrant PAC that aggregate in excess of $17,300 during the special election reporting periods. 11 CFR 104.22(a)(5)(v) and (b). For more information on these requirements, see the March 2009 Record. 1 “Overnight mail” includes Priority or Express Mail having a delivery confirmation, or an overnight service with which the report is scheduled for next business day delivery and is recorded in the service’s on-line tracking system.